It seems that another one project won’t appear on the stores’ shelves in the previously announced date. Only the day before yesterday, we told you that Wasteland 2 launch was postponed, but, fortunately, only for a few of weeks, and already today we have to upset the fans of Evolve game, the release of which will be delayed till 2015. Thus, yesterday, this year’s financial report of Take Two - the company, which includes 2K Games, the upcoming game’s publisher, - with the plan of many game releases appeared online. The latter one indicates that new Evolve release date is set for the 10th of February, 2015 in North America. Also according to this document, the screenshot of which is published below, another one project - Battleborn - will be launched a bit later than it was planned previously. This game will hit the stores only in financial 2016 year, although earlier its launch was scheduled for the first part of 2015. As for Evolve, its developers also told about the game release’s postponement in the project’s accounts in FB, Twitter and Google+ a few hours later. But, unfortunately, they didn’t tell the reason of such a decision. We can only suppose that the developers, as many other game creators, who have already taken the same decision, need more time to polish some shooter’s details and improve the project in general. And what do you think about it? 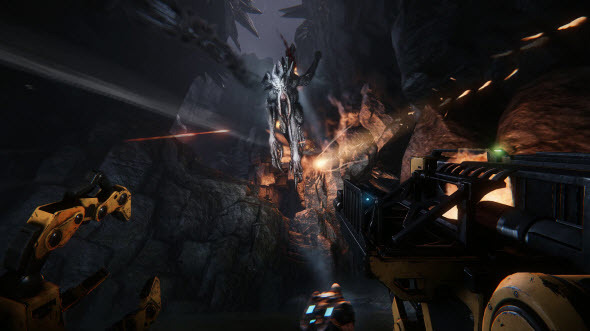 Are you upset with the delay of Evolve release date? Let us know in the comments below.